Migraine is NOT a headache. Really. It’s not. This is confusing for many of you who do not have migraine disease, I know. This does not make migraine disease a headache. Migraine disease is NOT a headache. A severe headache is one of the most common symptoms of migraine disease. It is not the disease itself. Many people living with migraine, myself included, can and do experience migraine attacks that do not include the characteristic head pain. This does not mean we are not having a migraine attack. We are. It does not mean we are not experiencing profound disability. We likely are. This is possible because migraine is not a headache. Migraine is a complex neurological disease that affects every system in the body. It affects how we hear, see, smell, think, feel, speak, digest food, and sleep. It can affect our balance, our sense of touch, our mood, our ability to use our limbs, and our energy levels. It changes the way we experience pain. And, yes, it often causes us to feel pain. But, again, it is not a headache. Migraine is a disease. A genetic, neurological disease that has no cure and is one of the top 10 most disabling conditions in the world. Calling it a headache reduces understanding and only perpetuates the stigma so often levied against those who live with it on a daily basis. Migraine is not a headache. So please, if you do nothing else to support those of us with migraine in the coming months, please, please stop calling it that. That’s my final #MHAM plea. Some days, I wake up with a migraine, live with it (irritably) all day, and go to bed with it. It escalates throughout the day, ramping up from a three or four on a ten-point severity scale to a seven or eight by nightfall. By the time I get my infant son to sleep and can finally crawl into bed myself, all I want to do is curl up in a ball and cry. On those days, it’s hard not to feel resentful and angry. This isn’t what I expected from my life. I didn’t expect to be limited by a genetic disease that means I can’t enjoy the hot, sunny summers of my youth; work at a stressful but fulfilling, high-pressure job under fluorescent lights; or make concrete plans two weeks or two months into the future without worrying that I’ll have to cancel at the last moment. I never imagined that I would miss feeding my son his first foods because I had to lie down in a dark room, or that I wouldn’t be able to supervise my daughter’s class field trips because I couldn’t promise I’d feel well enough to attend. I never thought I would elect not to go to medical school because I knew I’d never survive the 36-hour shifts in a brightly lit hospital that my internship would surely require. I didn’t expect to feel so powerless so much of the time, but I do. All these things I never would have expected, all these scenarios I never could have imagined – they happened. And, they keep happening every day. This is my life. But, I continuously remind myself that this disease is only a part of my life. Yes, I have migraines – an unpredictable, ever-changing, invisible illness that steals many, many precious moments of my life, moments I can never get back. But, I also have a wonderful family that challenges me and brings me more joy than I ever could have hoped for; a career I love; friends who support me; and a warm, comforting place to call home. All in all, I’m very blessed – even with migraine disease. Keeping sight of that fact helps me stay positive and banish any anger or resentment I may occasionally feel. What about you? What do you do to feel better and stay positive? June 2013, Migraine and Headache Awareness Month, is dedicated to Unmasking the Mystery of Chronic Headache Disorders. The 2013 Migraine and Headache Awareness Month Blog Challenge is a project of FightingHeadacheDisorders.com. It was 2008 when I learned I wasn’t the first in my family to suffer from chronic migraines. I had been diagnosed about six months prior with “intractable migraine with aura,” and I was feeling the loneliest I’d ever felt. One day, while talking to my dad on the phone, I found out understanding was much closer than I’d ever thought. “You should talk to Grandma,” he answered. I was bewildered. Why should I talk to my grandmother, his mother, about my symptoms? I was stunned. I knew migraine disease was at least partially hereditary, but I’d never known that anyone in my family suffered from the disease. When I called my grandma later that day, she admitted that she’d had them for decades. Figuring out the genetic link for my disease helped me tremendously. I didn’t feel angry or victimized that I got stuck with the migraine genes when neither my father nor my younger sister did. Instead, I felt blessed to have a living relative who knew the agony I experienced every day. A woman who had been where I was and lived through it. Knowing that someone close to me suffered as I did also gave me some idea of what to expect (a true blessing for such an unpredictable disease). While most women’s migraines go away as they age and/or with the onset of menopause, my grandmother’s never have. She still gets an average of at least one per week. And, while we don’t have the same kind of migraines (I have aura, she doesn’t; triptans help her, but do nothing for me), this knowledge of my genetic past has helped me recognize how important it is to learn how to live well with my migraines, just in case they don’t go away. Strangely, I don’t find this a depressing thought. I see it as a lesson in preparation, and a reminder to be thankful for all the other things my grandmother passed down to me. — Are you suffering from migraines that don’t respond to treatment or simply overwhelmed by the emotions and day-to-day difficulties of living with this life-changing disease? 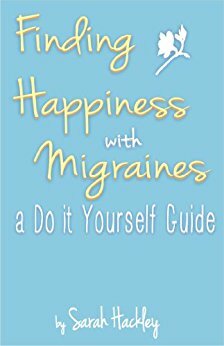 Check out my new e-book: Finding Happiness with Migraines: A Do-It-Yourself Guide. It’s available for sale on Amazon and BarnesandNoble.com. As is so often the case these days, I’m running a day behind. I had planned to post a blog every day this month in honor of Migraine Awareness Month and the Migraine and Headache Awareness Month Blog Challenge. Unfortunately, June 1st turned into June 2nd without my having even logged onto the Internet, let alone posted a migraine blog. This time, however, I have a very good reason for missing my deadline: I was finishing my e-book Finding Happiness with Migraines, A Do It Yourself Guide, which will be released sometime next week! If I were to chose just one person to be my Migraine Superhero, it would have to be my husband. Though he doesn’t truly understand what a migraine feels like, he always understands when I need to take a break because of a bad one. On those occasions, he helps me get into bed, turns out the lights, instructs our ten-year-old to “let Mama rest,” and takes care of the baby. He cooks dinner, reads to the kids, and brings me whatever I need to get comfortable. In our busy, busy household, where neither I nor my husband ever has a second of downtime, his actions are nothing short of miraculous. He also never resents me for my illness nor shames me for feeling badly. He doesn’t try to make me feel guilty, and he always lets me know how much he loves me and appreciates me. I wish every migraineur a “superhero” as warm, loving, and kind as mine.